"Father and Mother Meagles never deserved their names better, than when they took the headstrong foundling-girl into their protection again." In the eighteenth century, charities founded by concerned members of the upper classes, pamphlets written by well-meaning government employees, and essays from the general public all proposed solutions to the streets filled with children that were dependent on crime or begging to survive. The common thread between the proposed solutions was a need to shape poor children into useful members of society as quickly as possible. In part because they represented the future of the nation as part of the growing population, but also because they were considered a burden to society. This exhibit will explore the solutions proposed in the eighteenth century, such as the Foundling Hospital and Swift’s satirical proposal, before drawing attention to the ways that artistic representations of childhood misery commodified and continue to commodify children in miserable circumstances. The intentions of these charities and solutions were generally noble, but good intentions do very little to stop others from consuming the images of misery that stemmed from their efforts. I will focus on images and representations of children from the impotent poor class that stemmed from the Foundling Hospital, an institution established “for the Maintenance and Education of Exposed and Deserted Young Children” by Thomas Coram, or prominently feature the Hospital and its children. Many of these representations were consumed by members of society, especially the upper classes, as performances, works of literature, or artistic displays. I will explore representations of childhood misery from the eighteenth-century that include entries from Johnson's Dictionary and Chambers' Cyclopaedia, Jonathan Swift's A Modest Proposal and The Generous Projector, a charitable proposal attributed to Daniel Defoe, images of the Foundling Hospital itself, as well as William Hogarth's patronage of the Hospital and a play featuring two children from the Hospital that were switched at birth. The final pages will briefly explore the “echoes” of child commodification in modern society, such as our ability to purchase Lewis W. Hine's child-labor photographs and the mass consumption of Lemony Snicket's A Series of Unfortunate Events and the Netflix series based on it. Each page will help demonstrate the way eighteenth-century commodifications of children continue to haunt the way we interact with, portray, and consume unfortunate children in modern society. 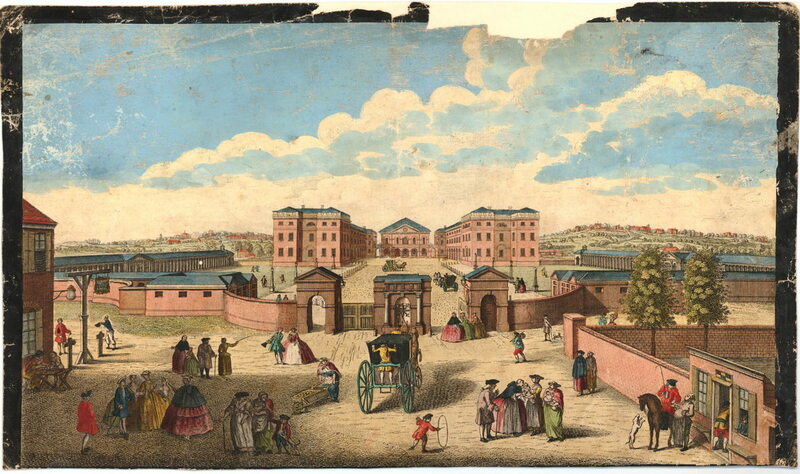 After: Louis Philippe Boitard, Colour View of the Foundling Hospital, from the driveway. London 1750. Collection Online. The British Museum.